Luke Wilson (red) scored for Wisbech against Sleaford. Spalding United secured their place in the promotion play-offs in Division One South of the Evo Stik League despite losing at home to mid-table Bedworth today (April 15). The Tulips went down 1-0, but other results ensured they can’t finish outside the top five. 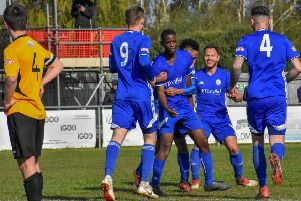 Third-placed Spalding still need two points from their final two games to clinch a home tie in the play-off semi-final and they play the first of those matches at Lincoln United on Monday (April 17). Michael Frew (red) scored for Wisbech against Sleaford. Stamford AFC were predictably crushed 4-1 at promotion-chasing Witton Albion. John King claimed the Daniels’ consolation goal. Stamford host play-off contenders AFC Rushden & Diamonds on Monday. Deeping Rangers moved to within a point of securing second place in the United Counties Premier Division with a 4-0 win at Oadby today. Goals from Dan Schiavi (2), Scott Coupland and Scott Mooney have probably already confirmed runners-up spot as their goal difference is vastly superior to third-placed Yaxley. Deeping now move on to the Lincs Senior Trophy Final against Cleethorpes at Lincoln City FC on Wednesday (April 19). Holbeach lost a topsy-turvey game at home to lowly Boston Town who clinched a 4-3 win with a controversial last-gasp penalty. Dan Dougill, Josh Ford and an own goal had seen Holbeach fight back from 3-1 down to 3-3. Champions Peterborough Sports fought out a thirlling 3-3 draw at Yaxley yesterday (April 14) in a game described as a credit to the UCL. Phil Stebbing grabbed a last-gasp goal for the home side to pinch a point, but that wasn’t enough to stop Sports registering a club record 23rd league game without defeat. Matt Sparrow fired Yaxley into a fourth-minute lead, but Dan Bucciero levelled for Sports four minutes later. Liam Hook restored the Cuckoos’ lead, but two Mark Jones goals gave Sports the advantage before Stebbing’s late intervention. Sports have three league games remaining, the first of which is at home to city rivals Peterborough Northern Star on Monday (April 17, 2pm) when third-placed Yaxley visit bottom club Huntingdon. Wisbech consolidated sixth-place with a come-from-behind 3-1 win over Sleaford Town this afternoon. Michael Frew, Luke Wilson and Billy Smith scored the goals for the Fenmen. Yaxley 3 (Sparrow, Hook, Stebbing), Peterborough Sports 3 (M. Jones 2, Sparrow). Witton Albion 4, AFC Stamford 1 (King). Oadby Town 0, Deeping Rangers 4 (Schiavi 2, Coupland, Mooney). Stamford AFC v AFC Rushden & Diamonds (3pm).